We all want to live big lives of significance that change the world in some way. Perhaps you feel like you have a product, a ministry or a business in you that can help change the world in some way. Well, we were all made for greatness in some form or another and God has great plans for all of our lives. 1 Corinthians 2:9 tells us that what no eye has seen nor what any ear has heard the great things God has in store for those who love him. However, greatness starts off small. No significant work started off huge. Everything in life starts off as a seed. Jesus told us in Mark 4 that everything in the Kingdom of God is as if a man cast seed on the ground (see Mark 4:26). The seed is planted, takes root and then grows (see Mark 4:26). 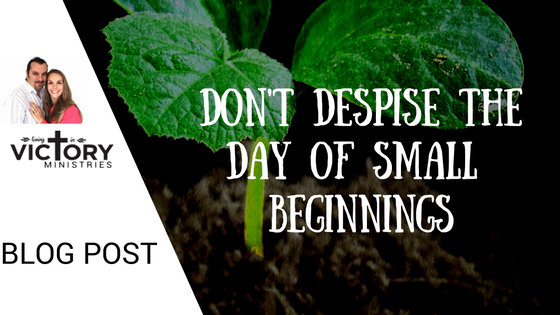 Zechariah 4:10 also speaks of not despising small beginnings because the Lord rejoices to see the work begin. In Isaiah 61 the righteous are compared to an oak tree displayed for the Lords splendour (see Isaiah 61:3). Our lives are supposed to flourish, just like an oak tree that is on display for all to see. But did you know an oak tree takes years to grow and become established? It didn’t just one day arrive and become this mighty oak. No, a seed was planted, watered and cared for and then over time a tree began to grow. That tree had to weather the storms of life until it reached maturity and could stand firm under any conditions. Only once it becomes significantly big, do people start taking notice of it. But the growth didn’t happen overnight, nor did most of it take place where other people could see. The real significant development of that tree took place out the limelight so to speak. Perhaps the little tree had to endure a drought and a storm in it’s first few years of life and yet no one took notice. Our lives are much the same and things that we endeavour to do start off small as well. You don’t become a great success overnight. There is no quick get rich scheme, nor does anything of value just happen. I’ve heard it said that things don’t just happen overnight but they started one night. Nothing of great value will be easy but we need to make a start. We need to plant the seed. Then we will have to tend to it, water it and help it grow. We will have to weather the storms, fight off predators and sometimes go through a drought to see our seed become a thriving tree. Most of this work and stewarding of what has been entrusted to us will probably happen in the shadows and without drawing much attention from other people. However, this part of the process is vital and can’t be skipped out. If Jesus said everything in the Kingdom of God is like planting a seed and letting it grow, then that seed we planted will eventually become a flourishing tree. If we want to build our lives to look like something of the kingdom, then that is the process we are going to need to follow. Great things take time. Perhaps you have a dream from God that you want to see fulfilled in your lifetime. Well, I want to encourage you to make a start. Plant your seed and start tending to it. Don’t look for the approval of someone else, nor be disappointed if you are not immediately recognised. Remember that seeds take time to grow and when you plant an acorn seed it doesn’t necessarily look like an acorn tree yet. However, if you keep looking after it and nourishing it, it will one day grow into that great tree you are wanting. Don’t give up in doing good, for at the proper time, you will reap a harvest if you do not give up (See Galatians 6). Byron from Living in Victory ministries sends out regular devotions, Christian encouragement pictures and blog posts. Be sure to sign up to our blog to make sure you always stay encouraged.